A scientist and artist, Arthur Huang documents the mundane task of traveling to and from work. His art showcases the heavy task of recreating his daily routes, sometimes at the end of the day. Just shy from engraving his every move, Arthur has created a world of travels which we were fortunate enough to learn about! Tell me a bit about the conception of Memory Walks and why you’ve decided to use eggshells as the base material. The Memory Walks Project was conceived in 2012 based on research published about place cells. Place cells are specialized neurons found in the hippocampus that make up part of our spatial memory or internal GPS. A specific set of these place cells fire at a specific location and becomes associated with this particular location. Place cells help us answer the “Have I been here before?” question. Before this, I was taking photographs of instances of waiting in my daily life, such as on train platforms or at intersections. 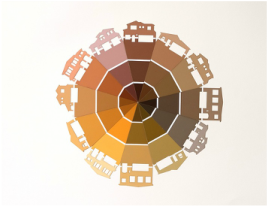 However, I became fascinated with the idea of place cells as a base to explore moments of transit in our daily lives. 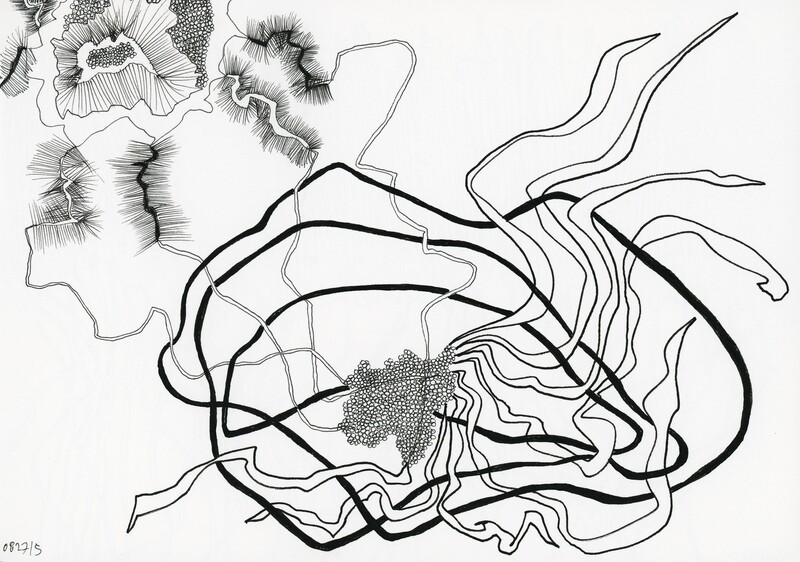 I began making drawings of specific walks that I would take from memory. 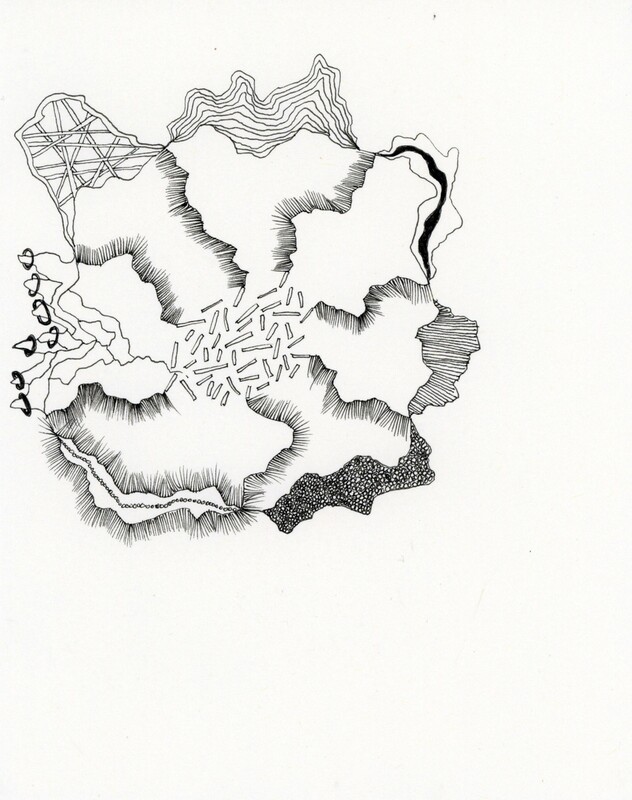 In the process of making these drawings, I began to include landmarks that I used to locate space in my mind. As it turns out, the landmarks are rather mundane such as stairs, elevators, and doors. I made these drawings in my sketchbook for several months but I became increasingly frustrated that I needed to start the drawing on the opposite side of the paper when I got to the edge. In addition, I noticed I was making adjustments to the line and landmarks based what I saw on the paper rather that based on what I re-imagining. Have you considered using a different mode of transportation, like a taxi, that might add an alternative route to draw? Or maybe drawing a specific event such as your walk through a grocery store? Back in 2011, I made some drawings based on the routes of the trains and subways that I took, using the routes found on a map to make the drawings. With that experience I started to realize that with modes of transportation other than walking, the experience feels less direct. Phenomenology has been an important influence in how I process experiences. When I am in a car, bus, or train, I am less likely to pay attention to the landscape because my attention is not fully on the experience of moving. Even if I were driving, my attention is taken away from experiencing the landscape due to the act of driving. With these modes of transportation, especially the bullet train in Japan, the landscape is also moving so fast that I am not able to fully process the entire experience. There is a wonderful book that I recently read by Frederic Gros called The Philosophy of Walking where he writes about how walking, being an autonomic movement, allows your mind to wander and contemplate other things even while moving through the landscape. As for the walks I make within a space such as my apartment, the grocery store or at work, I often get asked about these types of “walks” and I am interested in exploring that idea. They offer the potential for deeper exploration of my everyday walks and build layers of meaning for the project. It could be especially revealing for how I navigate particular spaces. I have to admit that I also feel a bit overwhelmed with these walks as I know it would tax my slowly declining memory. However, that in itself offers some potential! ​When I am in a car, bus, or train, I am less likely to pay attention to the landscape because my attention is not fully on the experience of moving. Even if I were driving, my attention is taken away from experiencing the landscape due to the act of driving. With these modes of transportation, especially the bullet train in Japan, the landscape is also moving so fast that I am not able to fully process the entire experience. Since we accomplish our everyday activities without much thought because it has become so routine, what part of that do you believe is important? Which aspects of everyday do you think we should be paying more attention to? It is precisely because our everyday activities have gone on auto-pilot that we should pay more attention to those routine activities. Most of us spend a good part of our day accomplishing these activities. Before moving from the Bay Area to Tokyo, I remember the countless hours I spent in my car stuck in traffic trying to get to and from somewhere. Sometimes, the amount of time I spent in my car was more than the amount of time spent doing what I actually wanted to do. In Tokyo, the waiting is different, but nonetheless there is waiting to get from one place to another. Because most galleries in Tokyo are not centrally located in a given area, most of the time spent gallery hopping is devoted to train/subway rides and walking rather than seeing art. It was during these times getting from one place to another that I started to pay more attention to my surroundings and my own thoughts. There is something within me that wants to make the most out of those seemingly inconsequential times and spaces. What does the new “print” series entail? What about the added layer accomplishes what you have been looking to add to Memory Walks? This new series grew out an idea that started with an artist book I made based on the Memory Walks Project. For the artist book, I crushed a Memory Walk eggshell inside a round cookie cutter and then poured acrylic medium to “cast” the broken pieces which was then used on the cover of the artist book. There was something about seeing this drawing made on a three-dimensional object flattened into two dimensions that made it seem more legible even though it became unintelligible. I think of it in a similar way to how we look different at a map or globe of the world. My Memory Walk drawings are not more legible in two dimensions, but there is a desire to make connections and stories between the lines on different eggshell fragments. Memory Walks leaving work from various projects I completed between 2013 and 2015. I scored the each of the fifty eggshells along the middle and broke them into two halves. I applied gel medium to the inside of the eggshell halves and then used a board to crush the eggshell halves onto the paper. The gel medium on the inside attached most of the eggshell fragments to the paper, but I added an additional coast of gel medium over the eggshell fragments to fix the eggshells on the paper. ​This “print” series, “Leaving Work” and another “print” series, “Six Days in October” were created for a group exhibition entitled “bricolage” in which thirty-nine artists were asked to created prints based on the title. I originally wanted to work directly with printmaking processes and had some ideas involving embossing, silkscreen, and drypoint. "It was during these times getting from one place to another that I started to pay more attention to my surroundings and my own thoughts. There is something within me that wants to make the most out of those seemingly inconsequential times and spaces." The hand drill/router adds really nice texture to the eggshells! Thank you! I really love how the eggshells appear to have nothing on them and only upon close viewing do you see the etched lines. It rewards close viewing of the work. You’ve kept record and created various series of Memory Walks over the years. Will this be an ongoing project? And do you think the print series will change its directions? Since graduate school, I have made lists of different everyday activities such as diet, spending, reading, just to name a few. The Memory Walks seems to be the most current iteration of this listmaking obsession. The current stretch of Memory Walk documentation from October 2015 until now is the longest consecutive stretch. Other periods of records since 2013 vary between one and three months. I hope the Memory Walks will be an ongoing project. My studio practice has been focused on ways to explore memory and how present those ideas in a visual format. Over the last fifteen years, I often find myself circling back to old ideas such as layering and gradations. From what I have learned with about the complexities of memory in a neuroscience lab, these are somewhat simplistic and in accurate ways of that visualizing memory. Even if I move beyond the Memory Walks in its current form, it has been a fundamental step forward in how I think about memory and opens up a new avenue for deeper investigation into the complexities of remembering and forgetting. How do you go about drawing on the eggshells? I imagine they are quite delicate. The eggshells are prepared by making holes at the top and bottom of the eggshell and then breaking up the yolk sac by inserting a needle into the egg. After that, I blow out the contents of the egg with the air duster that we all use to clean our computer keyboards. The eggshells are then placed in the microwave for thirty seconds to cook any remaining egg white and yolk inside. The heating hardens the eggshells a bit while also cooking any remaining yolk and egg white. Without this step, the eggshells start emitting a rotten smell within a few days. 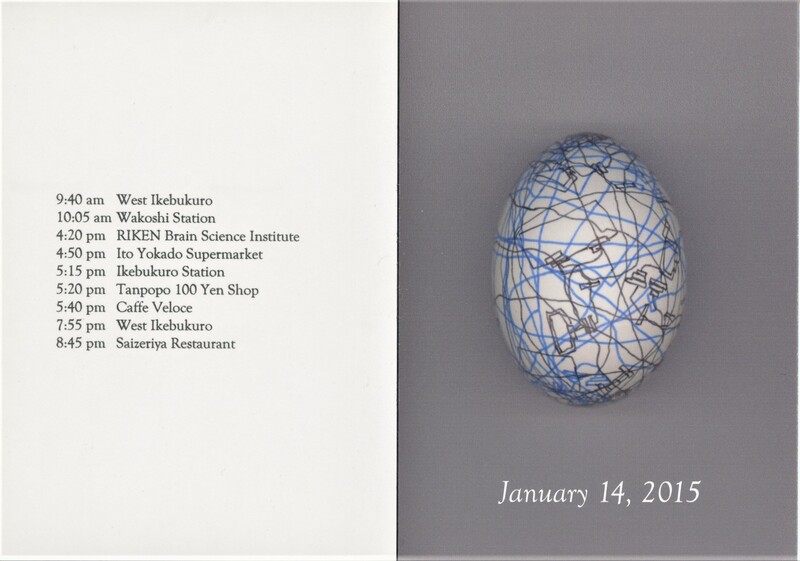 I noticed in Akiyoshidai Area Memory Walks 12.13.14 - 12.27.14, on one of the eggshells, there is a figure of a person. Tell me a bit about what makes this specific depiction of a memory walk different. In Akiyoshidai Area Memory Walks 12.13.14 - 12.27.14, I included eggshells of drawings done by participants in my Memory Walks workshop while I was doing a residency at AIAV. 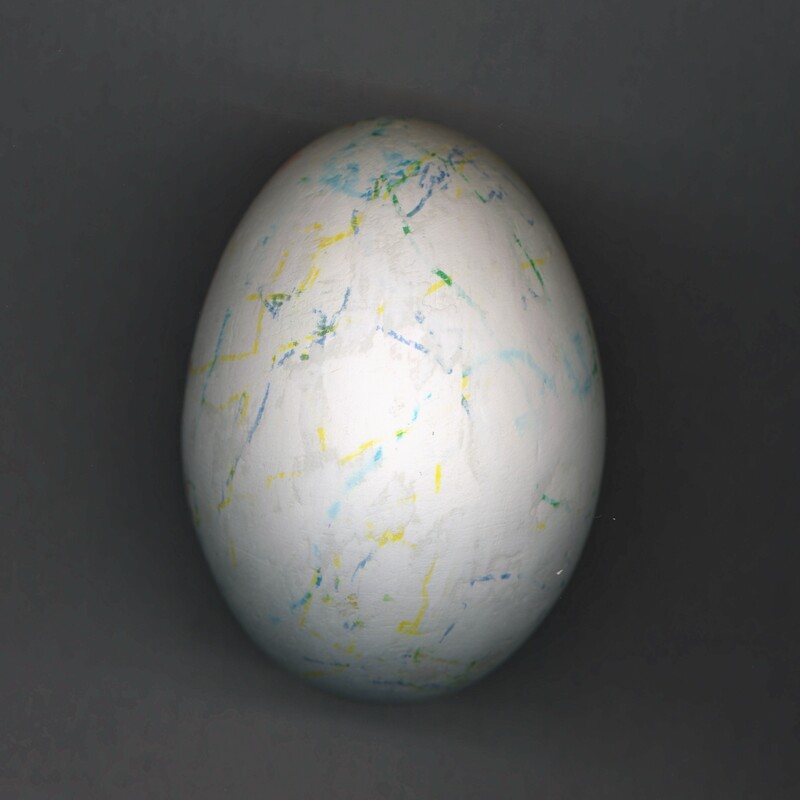 The eggshell with a figure was drawn by one of the participants. 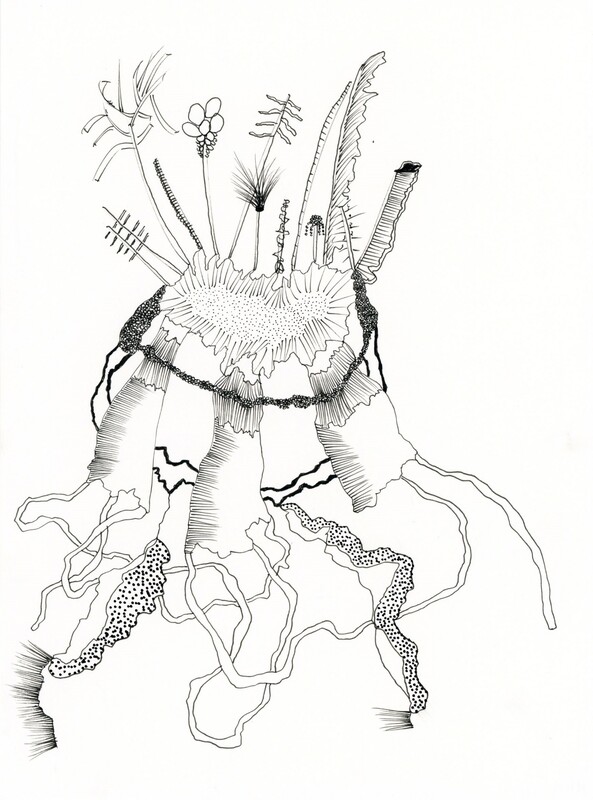 Seeing how different participants approach their drawings has become supplementary research for this project. The workshop has also become an integral part of this project helping connect the viewer with the ideas behind my project as well as having people tap into their own everyday memories and reflect upon what they remember or don’t remember. How many eggshells do you typically use in a month? And what do you with the contents inside? eggshells a month. As much as I try to make these drawings on a daily basis, other activities often get in the way. To compensate for this, I regularly have Memory Walk drawing intensives where I make many drawings at the same time. If I manage to make the drawings on a daily basis, the egg whites and yolks are usually eaten for breakfast or lunch. If many drawings need to be made at once, the contents of the eggs are usually discarded as I already have many bags of egg whites and yolks in my freezer. You’ve displayed Memory Walks in several different ways. On a table or stand in a pile or individually; as a hanging installation in a line and scattered. What is the significance of the display method and how does it affect your work overall? 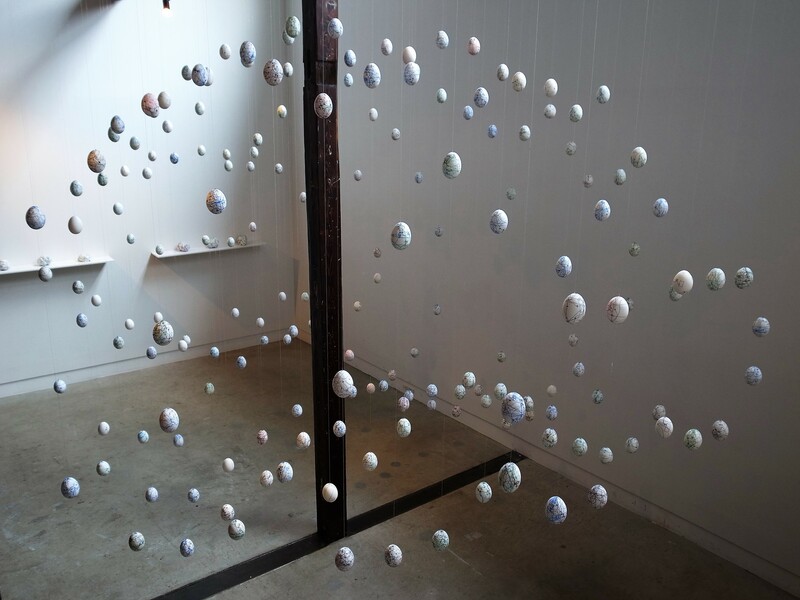 The original iteration of the project in 2013 was based on date and time with each day (strand) of eggshells being arranged according to the time of the walk. As the way Memory Walks are drawn became more established, I often use the arrangement of the Memory Walks to explore ways of expanding the ideas of the project. In my recent solo exhibition at HAGISO, I displayed six months of Memory Walks in the shape of a human brain. That installation along with the other Memory Walk variations in the exhibition have spurred some new ideas about trying to connect the Memory Walks to neuroscience/biology as well as to other everyday activities. Have you considered using mediums other than pen or ink? ​I spent a month making Memory Walk drawings using different marks, symbols as well as different materials. In the process, I became particularly interested in two different techniques. 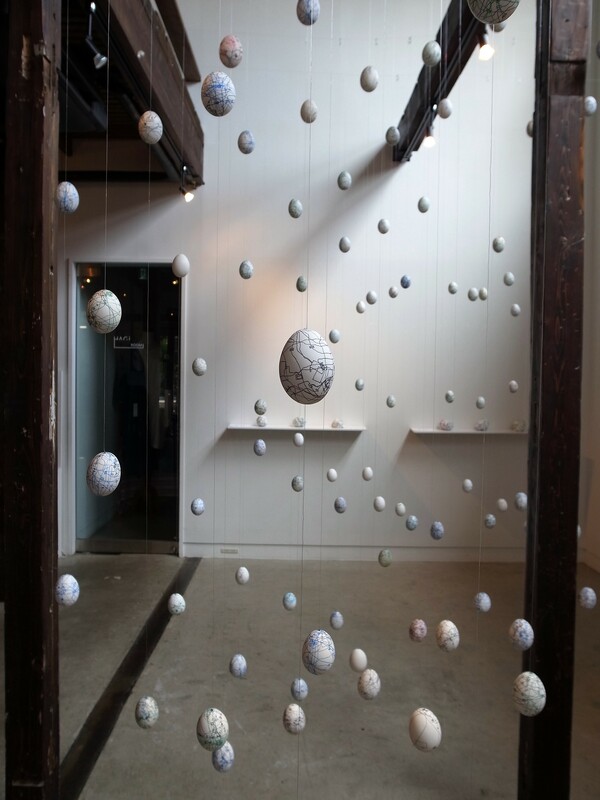 The first was the use of a hot glue gun to draw on the eggshells. 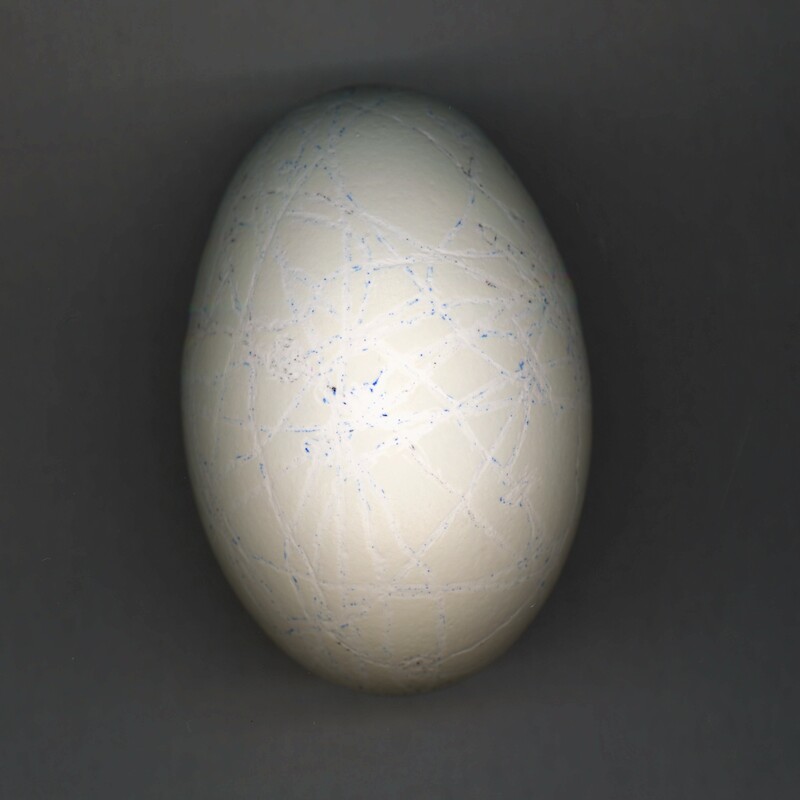 By making the lines with the hot glue, I created a framework of lines over the eggshell. I tried to remove the eggshells from the framework, but still need to improve that process. The other medium I have used and would like to do more with is a hand drill/router. For my exhibition “Memory Walks – Is This The Way I Went?” this past spring, I used the router to erase the drawn lines on the eggshell for a series of walks to and from work. For these walks, I took the same route on several different days and I saw erasing those lines/memories as a way convey the jumbled nature of those memories. Tell me a bit about your everyday drawings. Your inspirations, how you translate them and why you keep them minimalistic. I have always wanted to make drawing a daily practice, but did not make that happen until the summer of 2015. I was going through my Instagram feed at the time and I found Lisa Espenmiller’s Instagram feed with the hashtag #100daysinmysketchbook. I thought to myself, “I can do this, right?” So I grabbed one of my many unused notebooks and started making drawings on my train commute to and from work. My train commute is only about fifteen minutes each way - too short for me to read or do anything really productive. This is one of those in between times in our daily lives which we just try to get through so we can get to work or go home, but over the course of a month, a year, a decade, these fifteen minutes adds up! I wanted to make this time meaningful. I started by using the time on the train to take composite and panoramic photographs of the urban landscape which resulted in a number of different projects. ​To start, I was just making marks for the sake of making marks. I would do several drawings each way. Over the course of 100 days, I experimented with different drawing tools, motifs, concepts, and more. I think the short commute time is one of the reasons that the drawings tend to be minimalistic. I always saw these drawings as a way to experiment with new ideas without being focused on a particular drawing so I did not feel the need to fill the whole page. I would work until the end of my train commute and if the composition felt unfinished, I would quickly finish it up once I got home. "​Up until the moment that I make the first mark on the paper, I have no idea what I am going to draw. Once that first mark is made, be it a circle, line, squiggle, etc., the drawing grows based on how I respond to what is already on the paper. " After 100 days which was in the fall of 2015, I found myself in the routine of everyday drawing and decided to continue documenting my work. More than a year and a half later, I am still making these drawings when I can on the train as well as in the studio. About halfway through the #100daysinmysketchbook project, I discovered that I was gravitating towards and still gravitate towards obsessive mark making such as tiny circles or thin lines. It was a bit of a revelation for me because I have always admired artists whose practice involved these obsessive mark-making processes. Even though my studio practice is labor intensive, I did not see myself as having the mindset to make these kind of works. Realizing I am of the mindset capable of obsessive mark making has been a source of inspiration. 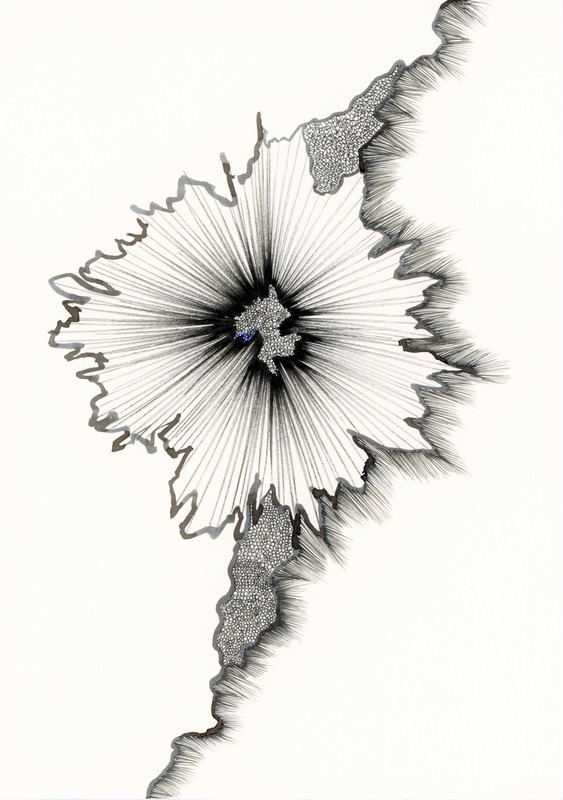 Another source of inspiration has been watching the evolution of these drawings. I am interested in how and why these drawings have evolved and/or devolved over time even though I mostly work in the same short span of time and space. I think the freedom I have in making these drawings as opposed to other projects has allowed them to connect to my everyday life in ways that I have yet to understand. ​I often get asked where I get my ideas for the drawings. My answer would be the act of drawing itself. Up until the moment that I make the first mark on the paper, I have no idea what I am going to draw. Once that first mark is made, be it a circle, line, squiggle, etc., the drawing grows based on how I respond to what is already on the paper. Admittedly, I do keep track of the commute time by listening to the announcements. Often in the last few minutes of the commute, I try to wrap up the drawing as best I can so I can start afresh the next day. Does drawing everyday become meditative? Most definitely! When you are tired in the morning and drag yourself out of bed and to the train station, those fifteen minutes on the train can seem like forever. When I start making a drawing, my focus shifts away from time and goes onto the dialogue between the paper and pen. Time dissolves as I focus on how to respond to the developing drawing. For the most part, those fifteen minutes pass in the blink of an eye and I have to step away from the pen and paper and get ready to get off the train. 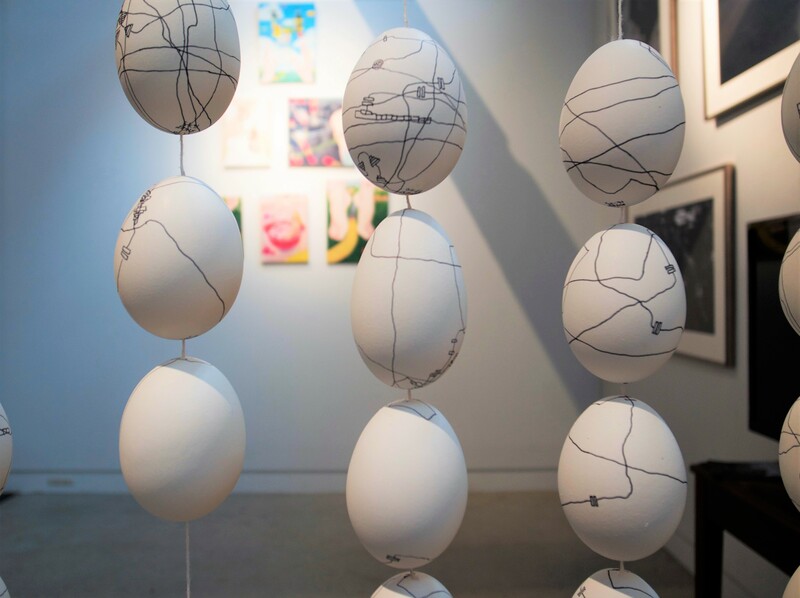 ​For the exhibition “Habits of an Artist” at hasu no hana, artist/scientist Arthur Huang will display aspects of his studio practice, artistic activities and everyday life to provide insights into the way he navigates the different aspects of his life. The foundation of this exhibition will be a collection of notebooks with drawings he tries to make on a daily basis since 2015. For all the drawings made in 2016, they will be displayed in chronological order. His rate of success or failure in making daily drawings is often influenced by other studio activities and the ups and downs of daily life. 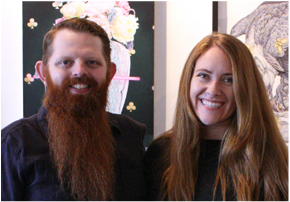 Days where drawings were not made, he will exhibit notes, social media posts, ephemera, audio recordings, and other inspirations that inform his artistic practice. In addition, photographs, notes, sketches, and other ephemera from all his exhibitions in 2016 will also be on display to help make sense of his successes and failures in his daily drawings. While the daily drawings and his Memory Walks Project may seem like disparate studio practices, both are linked to the routine of everyday life. A new iteration of his Memory Walks Project will also be installed to create a dialogue between these two practices for himself and the viewer to discover possible connections and potential new directions for both projects. For the artist himself, the realization of this exhibition is a chance to step back from the daily activities and studio practices to see where he has been, where he is and hopefully offer some glimpses into where he might go. For viewers of this exhibition at hasu no hana, it provides an opportunity to enter into Arthur Huang’s mind and see how one artist manages the responsibilities of work, daily life and studio practice to express the ideas in his projects.